Mental health care made accessible in this rural Health Center through TPO’s work. Whereas mental and behavioral disorders are all too common in Cambodia, the mental health service delivery is still very patchy. Mental health services have so far been implemented in 60% of Cambodia’s Referral Hospitals (RH) and only in about 2% of its Health Centers (HC). Those numbers do not respond to the current need for mental health services. In addition, case referral between Referral Hospitals (RH) and Health Centers (HC) is often inadequate resulting in less than optimal care for the patients. Also, the need for adequate referral by Village Health Support Groups (VHSG) to these Referral Hospitals (RH) and Health Centers (HC) needs to be strengthened to ensure people in the community have access to the right service at the right time. Also, the technical capacity of staff in Referral Hospitals (RH) and Health Centers (HC) to deliver the required mental health services as determined by the Ministry of Health (MoH), remains low. 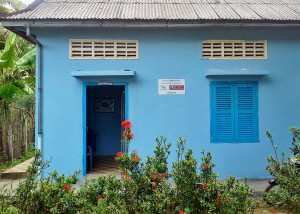 A rural mental health center set up by TPO Cambodia with the support of Louvain Developpement. With this project, we aim to strengthen the local mental health systems so they are able to offer accessible, good quality and culturally relevant mental health services to the community, in an efficient and sustainable manner. This project targets nurses and physicians working at Referral Hospitals and Health Centers as well as Village Health Support Groups in two districts (one in Kampong Cham province and one in Tboung Khmum province). Patients and people with mental health problems in the community will also benefit from the project. This project is a continuation of the work TPO and the project sponsor, Louvain Coopération, have undertaken since 2006 to improve the quality and accessibility of mental health care for the Cambodian people by strengthening the collaboration between mental health services at the hospital level and at the community level. 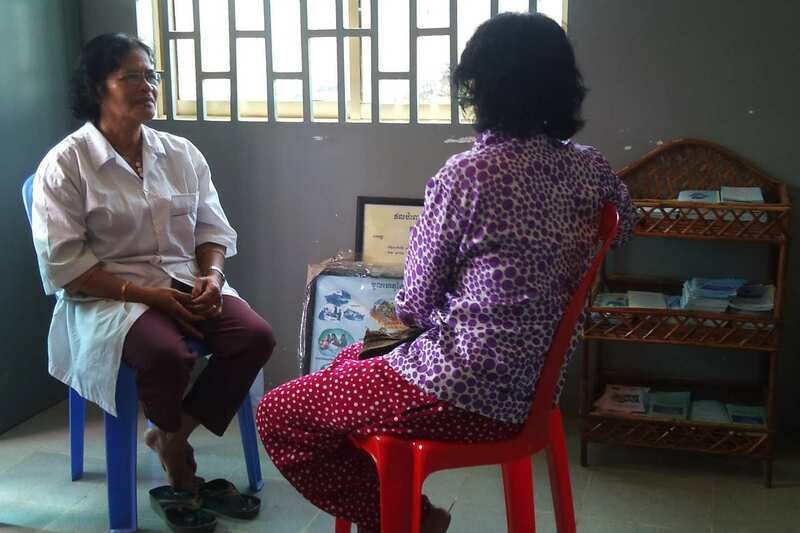 With our approach, we have built the capacity of health staff in the provinces of Kampong Thom and Kampong Cham and seen the number of patients seeking help for mental issues increase. With this project we are expanding this successful and sustainable model to other health centers and referral hospitals in Kampong Cham and Tboung Khmum provinces. To provide support and training to the local mental health systems in those target areas and help them strengthen their delivery of accessible, good quality and culturally relevant mental health services to the community, TPO is working from two field offices inside provincial referral hospitals: one in Chamkar Leu Referral Hospital (Kampong Cham province) and one in Ou Reang Ov Referral Hospital (Tboung Khmum province). And we are closely cooperating with the Kampong Cham Provincial Health Department (PHD), Ou Reang Ov–Koh Sotin and Chamkar Leu–Stueng Trang Operational Districts (OD) while our project staff will also identify relevant NGOs and other organizations in the target areas which might be able to offer complementary services for mentally ill patients and their families. 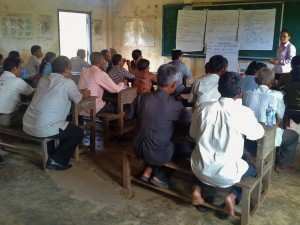 Practising counseling skills makes part of TPO’s Mental Health training for Village Support Groups. We follow an innovative & integrated approach between medical and non‐medical aspects in which there is a close working relationship between mental health clinics and the community. This in contrast with the currently prevalent practice in Cambodia where there is no connection between the two and where treatment by physicians usually is limited to providing medication, without any psychosocial intervention. As the causes of mental illness can be explained by bio‐psycho‐social factors, our project targets not only the prescription of medication (bio), but also counseling services (psycho) and dealing with patients’ environment (social). This results in not only more effective and sustainable mental health services. Sustainability can also been seen in the continuation of mental health services and the retaining of the mental health knowledge among staff in the health centers and the referral hospitals after the project. Similarly, VHSGs continue their role in the community to identify, manage and refer mentally ill patients to health centers and referral hospitals, but will have their capacity and knowledge further expanded during the project. Through the training of physicians, nurses and VHSGs tasks are shifted from those who are highly qualified to those who are less qualified but now enabled to do the work on the frontline. This in turn leads to better accessibility to mental health services for patients leading to recovery and/or the ability to seek early intervention and prevent relapse. This lifts some of the burden of their families. The project is also in line with the strategic plan of the Ministry of Health – once the mental health services are up and running, the MoH will supply medication and the respective ODs will take over. 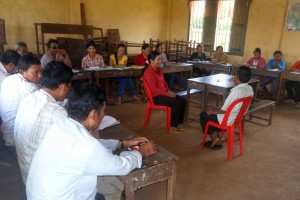 A Village Health Support groups during basic mental health training by TPO Cambodia. We train Village Health Support Groups in basic mental health (knowledge of disorders such as anxiety disorders, depression, psychosis and addiction problems) and equip them with the basic support skills of mental health first aid (MHFA). This will enable them to identify, manage and refer people with mental problems or illnesses to public mental health services (clinics and referral hospitals). We help establish mental health services able to offer mental health services as determined in the ‘minimum package of activities’ (MPA) by the Ministry of Health (MoH) of Cambodia. To achieve this, we provide mental health training to physicians and nurses in the targeted health centers and referral hospitals and with them, review their ‘minimum package of activities’ to ensure staff qualifies to provide treatment to mentally ill patients. The list of medicines and treatment conditions (mentioned in the MPA) are also reviewed with the aim to establish a regular supply of the required medication to the health centers. TPO staff coach nurses in rural hospitals and health centers in counseling, psycho-education and home visits. Enable referral hospitals to implement and deliver mental health services as determined in the ‘complementary package of activities’ (CPA) of the Ministry of Health (MoH) of Cambodia. This is aimed at ensuring they are able to diagnose and treat walk-in or referred patients with mental disorders and provide follow‐up, and can play a role in mental health education, counseling, and community based‐care. Their work will be reviewed in order to deliver better services and to work out a strategy to achieve a more regular supply of the required medicine. Referral mechanisms between referral hospitals (RH), health centers (HC) and Village Health Support Groups (VHSG) to HC and RH will be reinforced to ensure people in the community have access to the right service at the right time. Capitalize on the processes, results and experiences of the program by publishing guidelines in counseling, psycho‐education and home visits for mental health workers and social workers. Conducting action‐research on prescription of psychotropic medications in order to build capacity at the health centers to do this effectively and conduct a conduct a prevalence study on Generalised Anxiety Disorder (GAD) which is the disorder most commonly diagnosed by physicians working in mental health services in Cambodia and help develop a simple diagnostic checklist of GAD to help physicians and nurses at the health centers and referral hospitals make a proper diagnosis and provide an appropriate treatment. We also review and continue the research done so far on mental health concepts in Cambodia. A Village Health Support Group after mental health training by TPO Cambodia – our trainers are to the left and the right.